Did RT founder, former Putin aide Mikhail Lesin leave the US after his death? The Russian rumor mill churned out a multitude of conspiracy theories with respect to the death of Mikhail Lesin – a prominent media mogul, credited with being one of the founders of RT (formerly known as Russia Today) and a former aide to Russian president Vladimir Putin. Lesin was found dead in his Washington, D.C. hotel room in November 2015. Ironically, RT – the very network he helped to spawn – incorrectly reported that Lesin died of a heart attack. This claim was based on an alleged statement by Lesin’s unnamed family member. It should be noted that his daughter, Ekaterina Lesina, is a bureau chief at RT. In March 2016, the DC medical examiner’s report revealed that Lesin died of blunt force injuries to his head. Other contributing causes included blunt force injuries to the neck, torso, arms and legs. The manner of death remains “undetermined” and an active investigation continues. The delay in releasing this report only added fuel to the fire of suspicions. “We adhere to the national standard of completing 90 percent of autopsy reports within 90 days,” LaShon Beamon, of the Office of the Chief Medical Examiner in Washington, told NPR. “But there are outliers. And this one fell out of that range.” Nationwide delays and backlogs are not uncommon in major metropolitan areas. For example, about 180 bodies are currently stacked up at the Los Angeles County morgue because of delays in processing. Toxicology tests are taking more than six months to complete and there is a backlog of about several hundred. Staff members, including the county’s top medical examiner, Mark Fajardo, are quitting because of this growing crisis. The mystery behind Lesin’s demise is deepened by murky circumstances. On Nov. 3, two days prior to his demise, Lesin failed to attend a Kennan Institute fundraiser, in spite of reportedly traveling to Washington, D.C. specifically for that occasion. Lesin bought tickets for a table of 10 at the cost of $10,000, but never picked up his place card. A longtime friend and business associate of Lesin’s, Sergey Vasiliev, waited until the release of examiner’s report before talking to the press about Lesin’s final days. Vasiliev’s statement placed all blame on Lesin himself, by alleging that his routine drunken stupor allegedly caused Lesin to frequently fall down, unwittingly causing blunt force traumas to himself. This convenient tailor-made “explanation” for reported injuries was admittedly coordinated with the Russian Foreign Ministry and “others familiar with the sequence of events.” Instead of extinguishing suspicions, it only arouses more doubts. 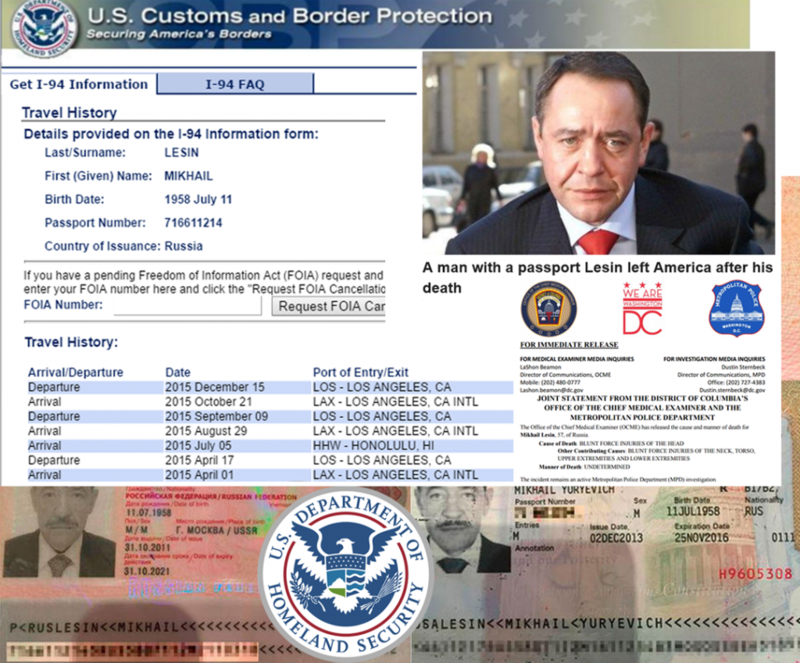 The mystery seemed to deepen with another curious discovery: Department of Homeland Security’s database of I-94 records reflected Lesin departing the U.S. in December 2015 – after his death in November. Rumors swirled, leading to conspiracy theories that Lesin might be alive and in the FBI’s witness protection program. These suppositions were fed by the fact that last year, Mississippi Senator Roger Wicker called for Lesin to be investigated on suspicion of money laundering and corruption. He reportedly amassed millions of dollars in assets in Europe and the US while working for the Russiangovernment, including $28 million spent on real estate in Beverly Hills. Wicker wrote: “That a Russian public servant could have amassed the considerable funds required to acquire and maintain these assets in Europe and the United States raises serious questions.” To date, it is unclear whether the FBI ever opened an investigation or questioned Lesin at any point in time. As for Lesin’s curious posthumous travel, the explanation is quite simple. Department of Homeland Security’s Bureau of Customs and Border Protection (CBP) gathers travelers’ arrival/departure information automatically from their electronic travel records. The DHS does not have reliable data on emigration and non-immigrant departures from the United States. The failure of the DHS to consistently update the alien’s record—for example if the authorized period of admission is extended or if the immigration status changes—is a major factor that prevents the DHS from calculating reliable estimates of overstays. The CBP’s departure data primarily comes from passenger manifests for international flights, provided by the airline carriers. This data is highly unreliable, since carriers provide manifest information well before a traveler actually boards the aircraft. The electronic I-94 may indicate a departure in the travel history if the traveler had booked a return flight (even if the return ticket is not used). This lax approach to tracking visitors to the United States contributes to the fact that nearly 500,000 foreigners overstayed their visas in 2015. “Visa overstays” represent an estimated 40% of the growing population of millions of undocumented immigrants living in the country. While this twist in the story has a simple explanation, the same can’t be said for the mystery at large. Active investigations are underway and at this point, the Metropolitan Police Department and the FBI in Washington declined to comment. There is undoubtedly more to be uncovered about the demise of Mikhail Lesin, a shadowy figure in life and in death.